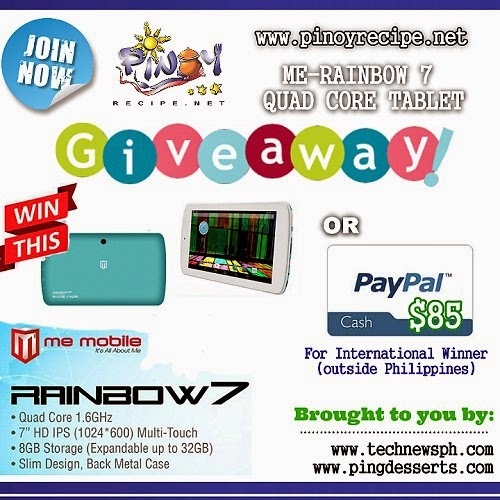 Here’s another giveaway hosted by Filipino Recipes Portal. This is our first Giveaway event for this year, we are going to make this a monthly event. This is our way of saying thank you to all of you who support our Food Blog. This ME-Rainbow 7 Quad-core tablet won’t hold you down. It is equipped with upgraded specifications that set it apart from its standard counterparts. 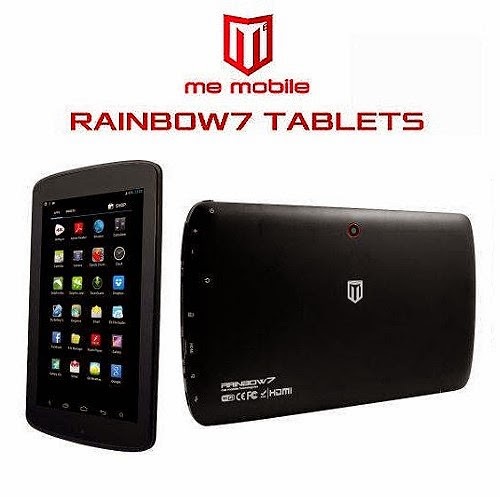 Fast and ultra-responsive, this ME Rainbow 7 Dual Core Tablet boosts your usage with its Dual-packed processor running at 1GHz. Less lags and more apps to open in a single boot, it gives you the advantage on multimedia playing, gaming, and multitasking activities. Disclosure:Filipino Recipes Portal is responsible for shipment of the prize . This event was organized and hosted by Filipino Recipes Portal please contact PinoyRecipe.net with questions or if you want to be featured on our the next Giveaway event! This event is in no way associated with, sponsored, administered, or endorsed by Facebook, Twitter, Google, Pinterest or any other social media network. The disclosure is done in accordance with the Federal Trade Commission 10 CFR, Part 255 Guides Concerning the use of Endorsements and Testimonials in Advertising. This looks like a really nice tablet. My boyfriend has been wanting to get a replacement. Would be awesome to win it for him. Of course, he would have to fight the kids for it! Amazing giveaway! So generous of you! Thanks for this great giveaway. I hope I win! I commented on Pancit Canton great all in one meal! Great giveaway! thank you for this great giveaway and a chance at winnning it. Awesome giveaway. Thanks so much and have a great weekend. I saw a good recipe for blueberry cheesecake on the recipe site. Since I put many packages of blueberries from my blueberry bushes in the freezer, the cheesecake recipe caught my interest. Hoping to win this great gadget as my first. Let me experience how great it is to have a tablet as cool as this. Thanks for the chance! This is a very generous giveaway. I appreciate looking at the Pinoy recipe site, as it has given me some new ideas. Thank you for hosting this. Thanks so much for this giveaway it is so nice for you to do this and I hope to win! Thanks for the Recipe and thanks for the giveaway! Thanks for this opportunity to win that awesome tablet! Hope to win this time. Love this giveaway. This would definitely be so EXCITING to win. It would definitely be used a lot! Thanks for the giveaway! I really need one. Would loves to try the avocado sorbetes recipe! Thank you for the opportunity to win this tablet! This is a great opportunity. Thank you so much for the chance to win this great prize!!! I love all of the great recipes on your site. I am very excited to try and make a few of them. Very nice site and thanks for the opportunity to win this product. Really amazing giveaway and tablets are today’s cookbooks. Thank you! This has a lot of great features at a great price. Thanks. This would be awesome to win. It has a lot of great features. Awesome giveaway, thanks for the chance to enter. Thanks for the shot at winning this fabulous prize! !